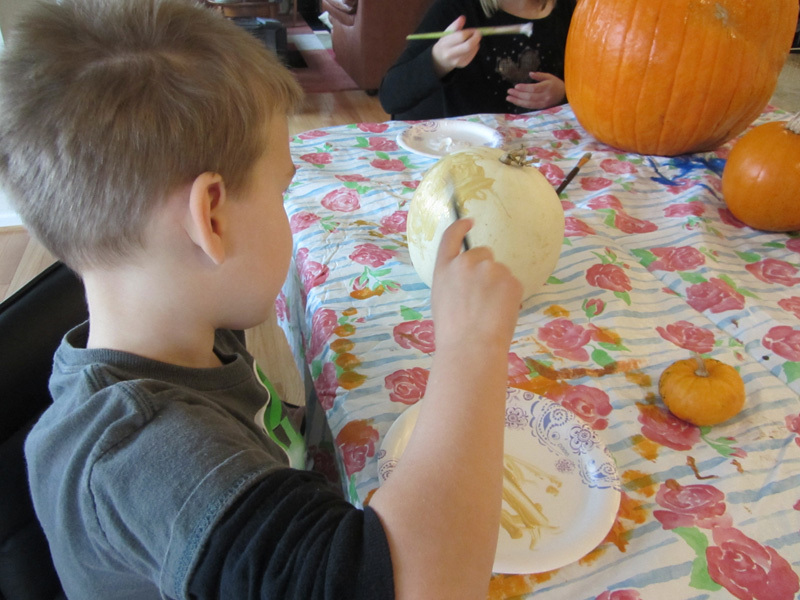 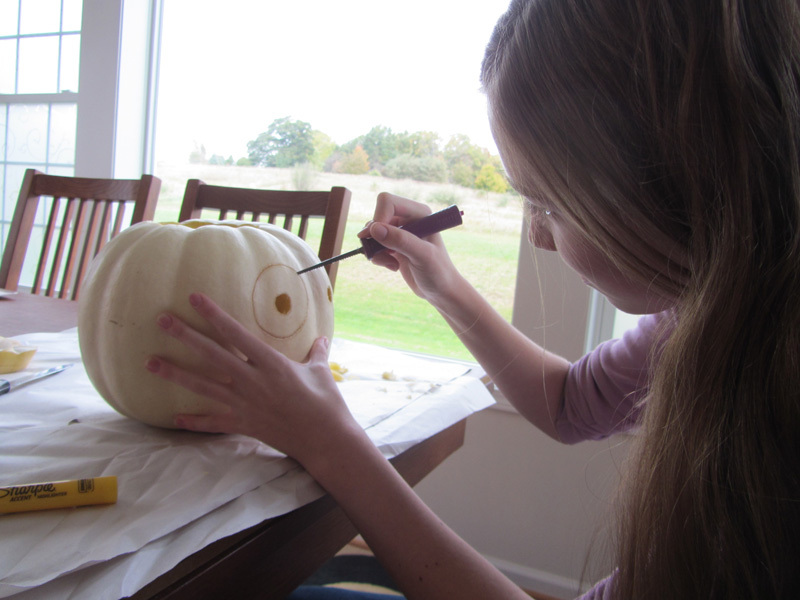 The kids had off school on Friday so we spent the better part of the day carving and painting our pumpkins. 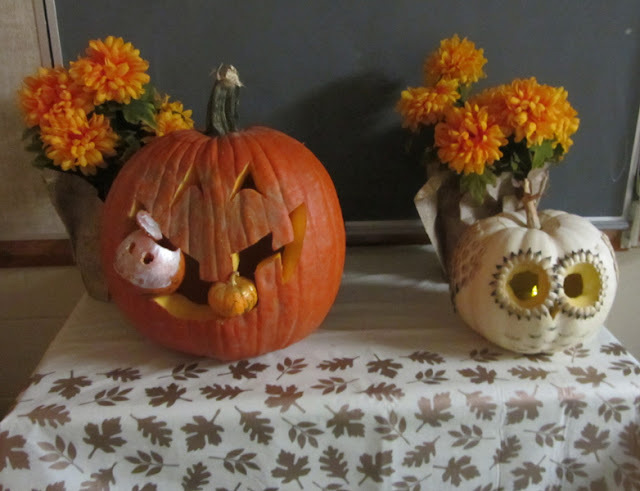 I didn't want to do it too much earlier in the month because Saturday was the pumpkin carving contest at our church Trunk or Treat and I wanted our pumpkins to look their best. I had these grand ideas of how the pumpkins would look thanks to Pinterest, but you know how that turns out, or rather how it doesn't turn out. 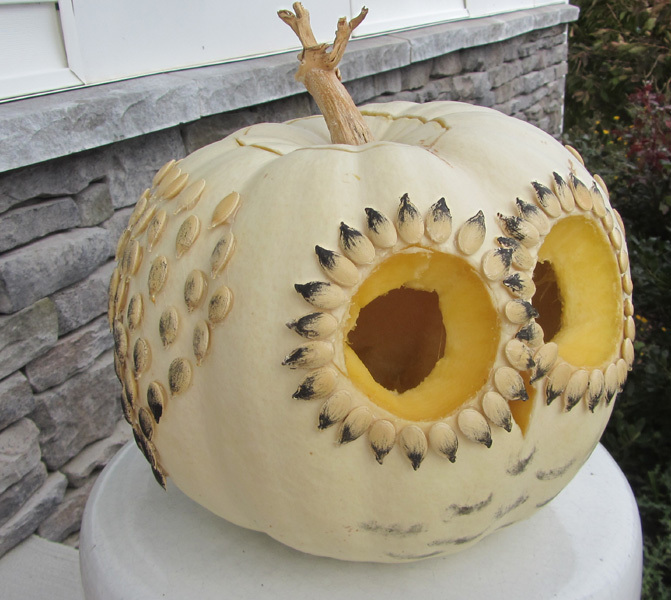 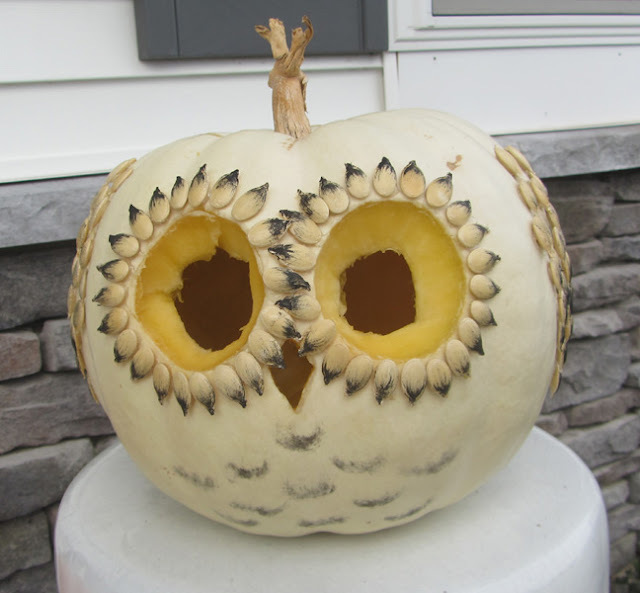 The only one that looked great was my 14 yr old daughter's pumpkin that she made into an owl. It doesn't really matter how they turned out, we all had fun and that's the most important part, right? 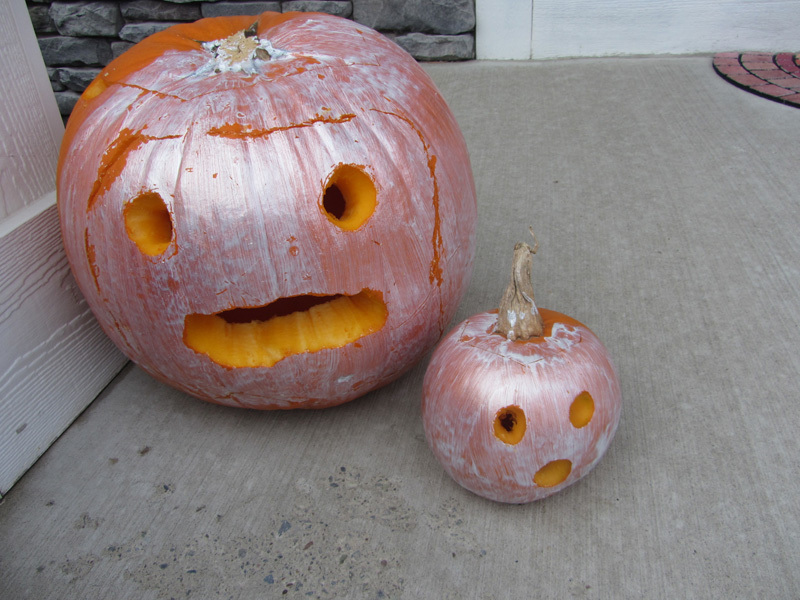 The little kids started off by painting their pumpkins. My 4 yr old painted his white pumpkin gold while my 8 yr old painted her orange pumpkin white. 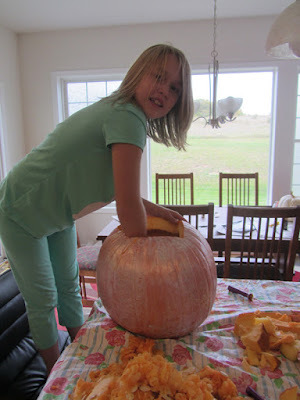 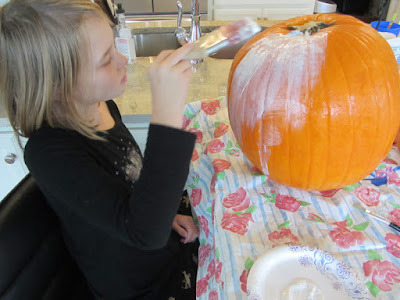 Since the orange pumpkin was big, we found that a regular paint brush rather than a craft or artist paint brush worked best. While I was helping my daughter, my son got into the pumpkin carving set and used one of the tools to make lots and lots of little holes in his pumpkin. Then he wanted me to carve it out like a pterodactyl. 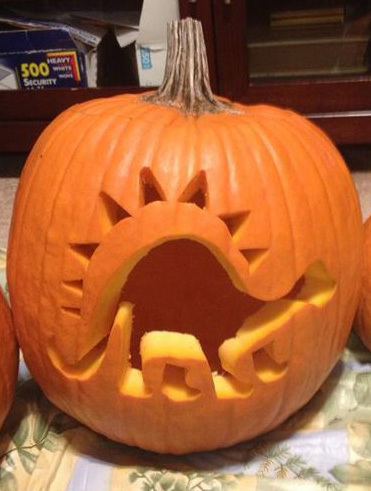 but at the last minute he changed his mind and really wanted a pterodactyl. 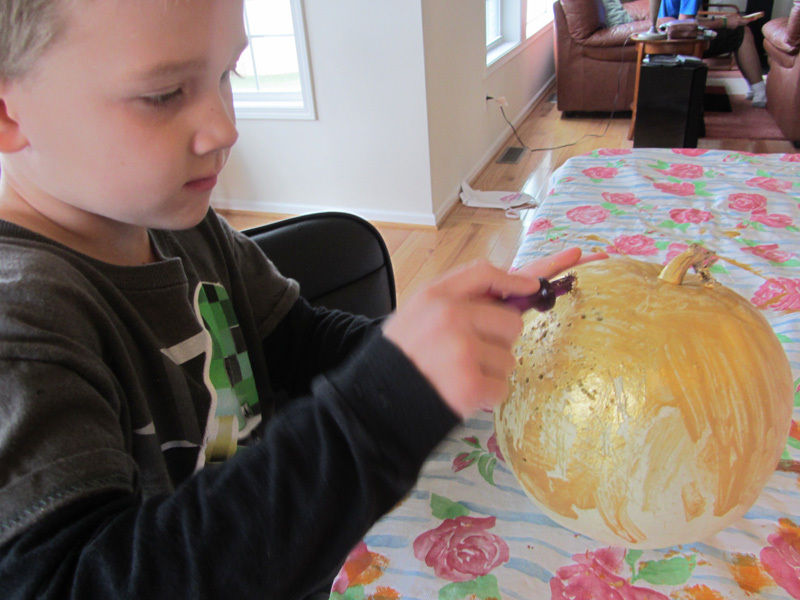 In my defense he did help by making the wings bigger and cutting off part of the head, so if you can't tell what it is, I don't blame you. 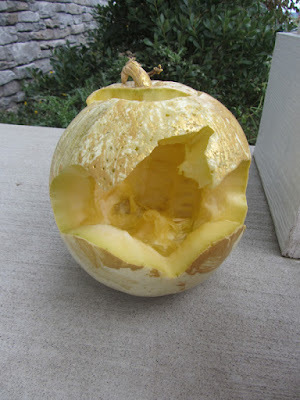 My 8 yr old had a plan to make ghost pumpkins and I think they turned out pretty great considering she did most of the work herself. 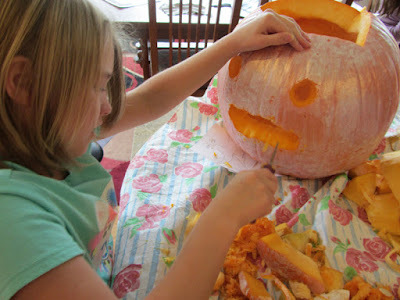 I think her favorite part was scraping out the insides. 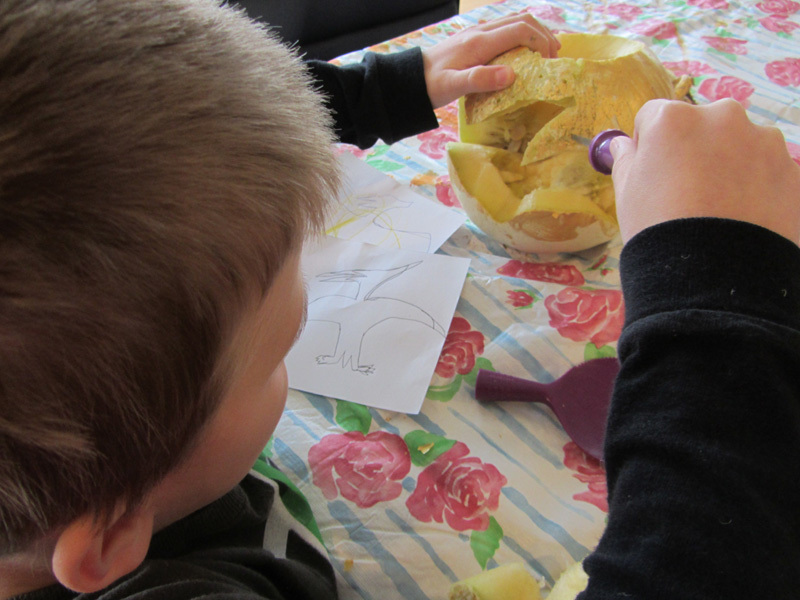 We washed and cooked the seeds and then she hot glued them onto the pumpkin to make feathers and wings. 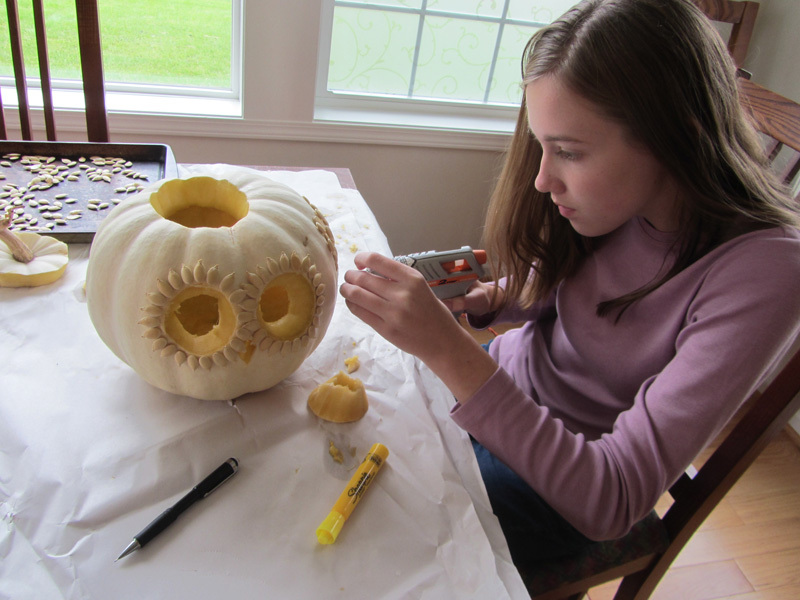 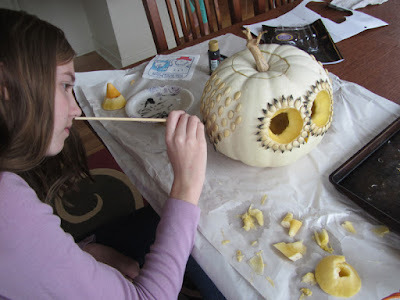 She also used black paint on parts of the seeds to make them stand out against the white pumpkin. Like I said, she is very artistic. 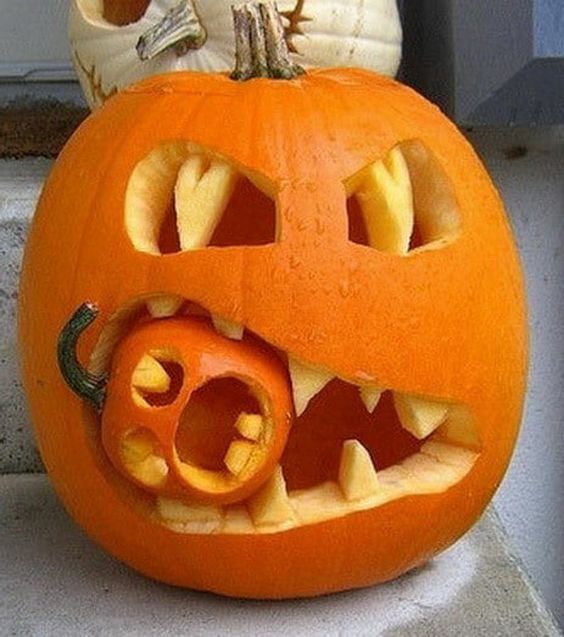 And here is my version. 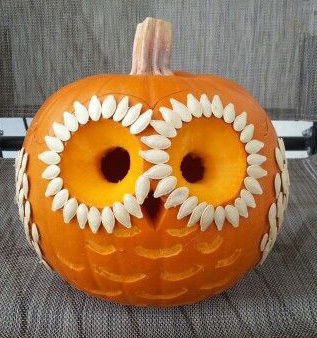 It turned out happy instead of scary. Carving pumpkins is harder than it seems and I've got to give a lot of credit to those super creative (or patient) pumpkin carvers out there. 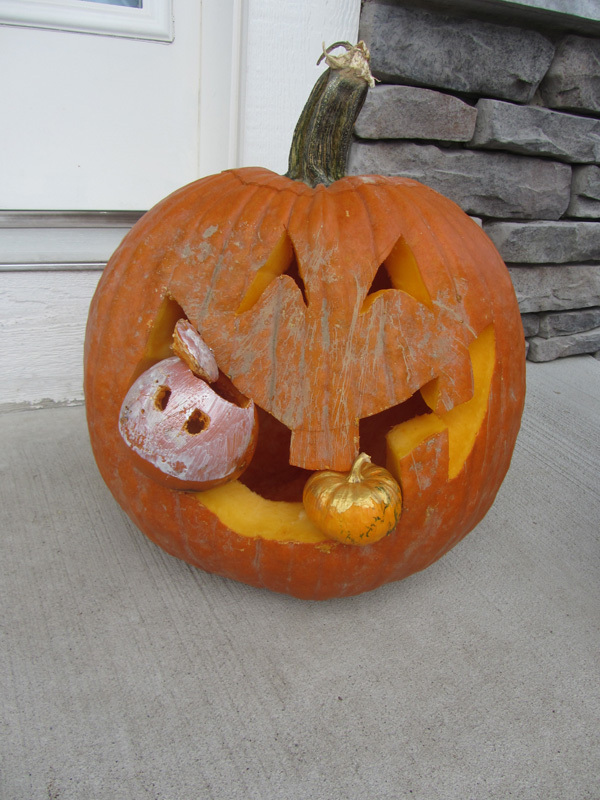 We entered my and my daughter's pumpkins into the pumpkin carving contest. My daughter's owl pumpkin came in first place.